The right color palette can do a lot for your wedding. 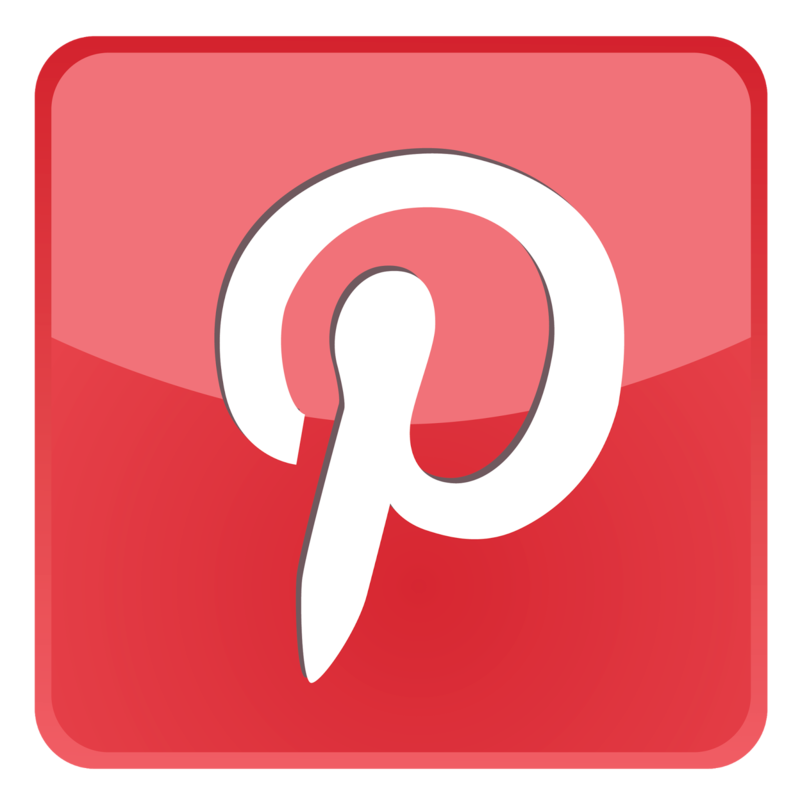 It can give it style and energy, set a tone and establish a strong theme. The trick is to select wedding colors that feel fresh and original. 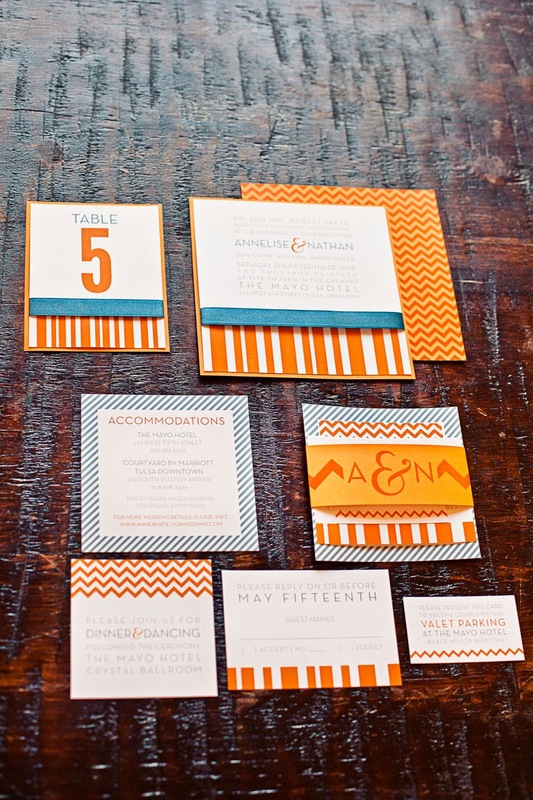 One hot new style is a modern orange and blue wedding. Orange and blue are opposite each other on the color wheel, which makes them complementary colors. It is a bold pairing, and each color will make the other pop and appear to be brighter. The result is very aesthetically pleasing, while also being a bit daring. What could be better for your wedding color scheme? When choosing the particular shades to put together, think about the impression that they give. The orange and blue should also be of a similar intensity. For instance, on a hot summer day, tangerine and aqua blue feel tropical and festive. Peach and robin's egg blue are soft and feminine for a spring garden wedding. 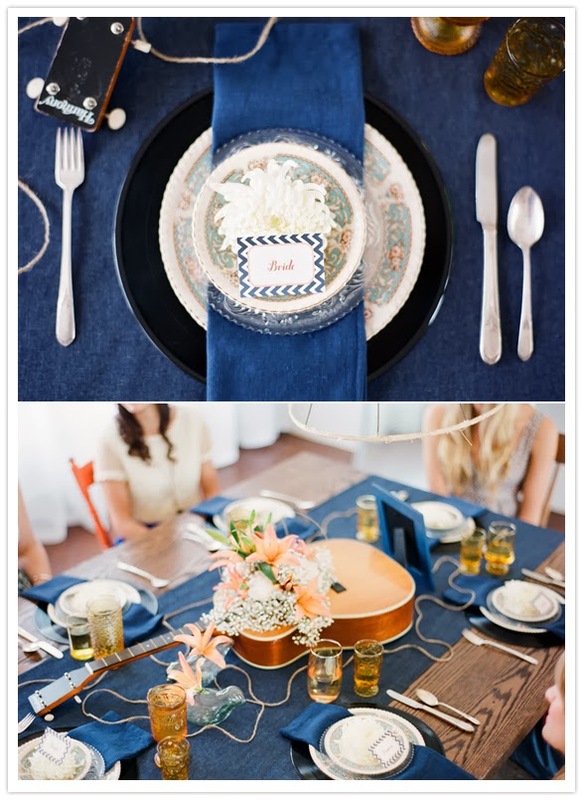 A pure orange and a navy blue are bold and modern, perfect for a confident bride with a contemporary style. Any combination of orange and blue is going to feel updated and fresh. Once you have narrowed down which shades of orange and blue are best, it is time to start using them. The wedding invitations are always a good place to introduce a color scheme. The peach and robin's egg blue would be lovely on old-fashioned letterpress invitations. Choose a soft pink paper with a vintage inspired design like a bird or a drawing of flowering branches done in the light blue. 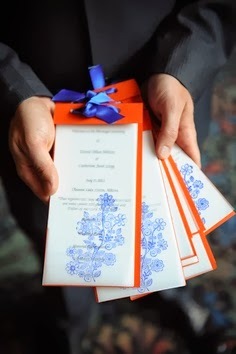 The bold orange and navy would look amazing for white invitations accented with a graphic border in a modern damask pattern. Cheerful polka dots would be a great use of summery tangerine and aqua. 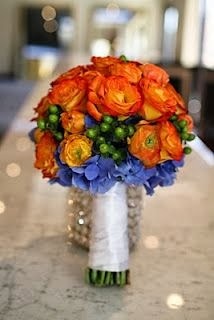 Orange is a very versatile color for wedding flowers. From bouquets, to centerpieces, to accent pieces, you will find all sorts of gorgeous orange blossoms to include. Blue, on the other hand, is not a widely available color for flowers, so plan to use it as an accent. Tie up a bouquet of bright orange gerbera daisies with a navy blue and white striped wrap. Or display soft ruffly apricot sweet peas in vintage robin's egg blue pitchers and footed vases. For a unique take on the tangerine and aqua palette, fill the bottoms of clear vases with bright aqua blue crystals or marbles, then top with festive flowers in shades of tangerine. The bridesmaids' attire is another place that you will surely want to use your wedding colors. Tread lightly with orange bridesmaid dresses. They can look absolutely fantastic, or you can end up with a row of (very grumpy!) bridesmaids looking like Halloween pumpkins. Peach is flattering on a range of skin tones, but the bolder oranges shades can be difficult to pull off. They will tend to work best on brides with deeper skin tones. 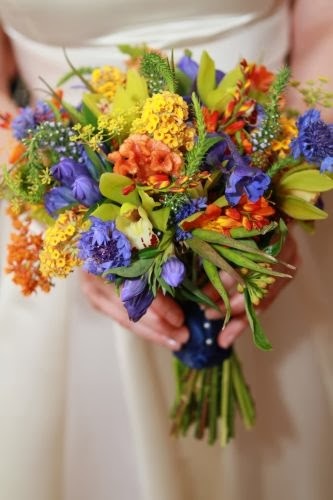 In many cases, pulling the blue into the bridesmaids' dresses is the best way to go, especially considering that they will be carrying orange bouquets. This will allow the dresses and bouquets to pop against one another. For the bridesmaid jewelry sets, you can either have pieces custom made in crystals in your wedding colors, or choose neutral sets of bridesmaid jewelry. White pearls look nice against the bold orange and navy; simply silver bridesmaid jewelry looks great with the summery aqua and tangerine palette. Once you have designed your wedding flowers and bridal party attire, you can think about the rest of the wedding. 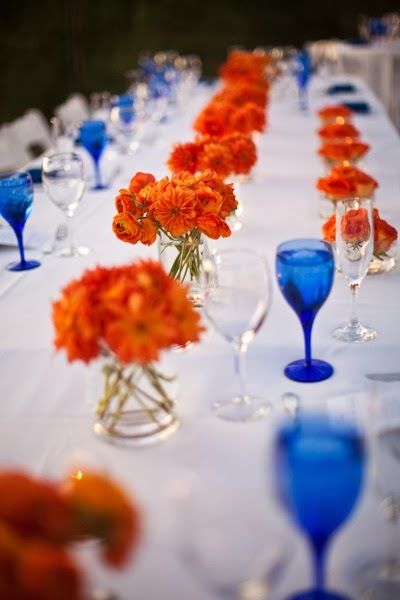 Your blue and orange color palette will look great carried into the table linens, favors, and even into chandeliers. 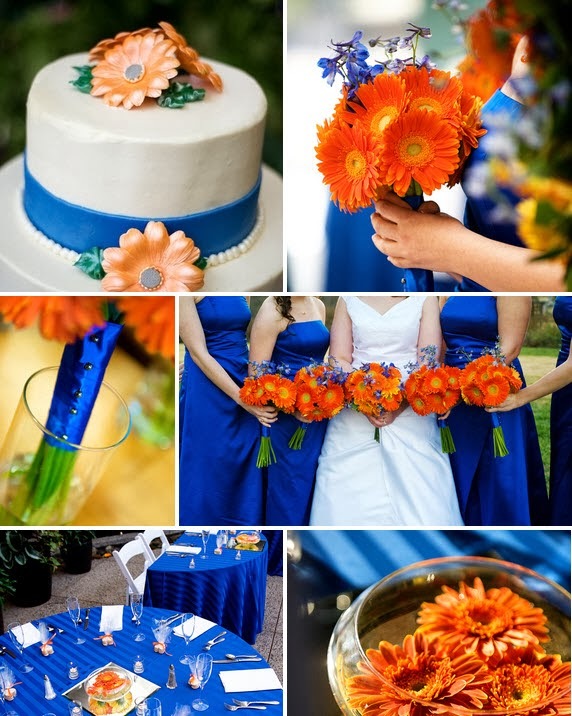 Have fun designing a wedding in blue and orange that is modern, chic, and a true original.